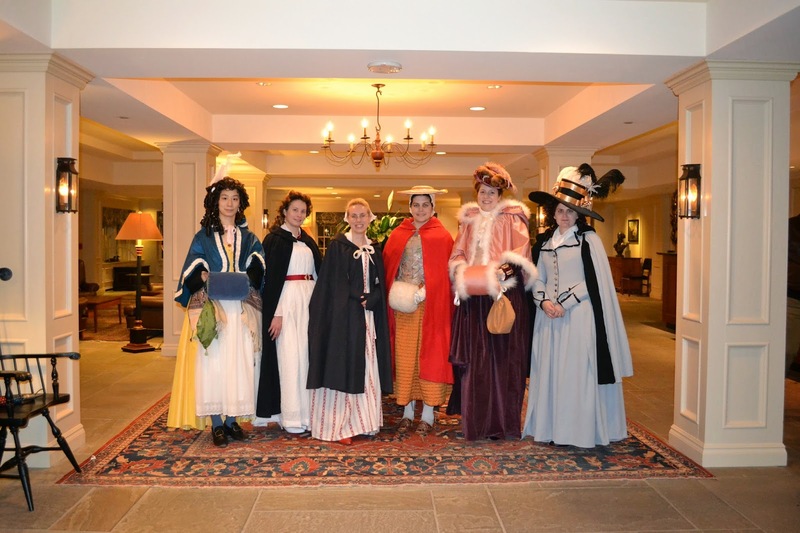 A few of us went to Williamsburg last weekend for the Costume Budget Spa Weekend! 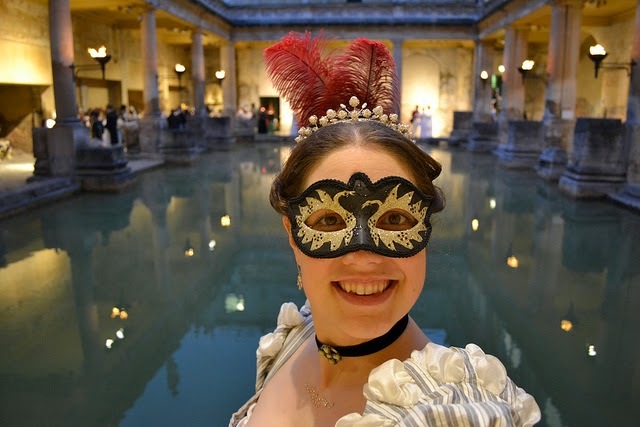 Basically this is something I've wanted to do forever, so I decided this was the year, and planned a little group trip to head to Colonial Williamsburg for costuming & spa fun! I'm calling this the First Annual, because we all agreed that this was so much fun, we needed to do this again next year! So next year...another costumed trip to Williamsburg around this time :)...yay!! The plan for the weekend: took off work Friday to drive down...check into the Williamsburg Lodge late afternoon, dress for a Williamsburg Chamber musical concert, wake up Saturday & spend the day at the spa, costumed late 18th century tavern dinner Saturday night, a little shopping & exploring Sunday before heading out at lunch/early afternoon home. Friday night we ran out of time to dress before the vocal & musical Chamber concert (with one exception), because some of us, *cough*, me, *cough* and a few others who shan't be named, forgot our swimsuits! So it was off to Target for swimsuits, wine/champagne & gummy bears, because uh, yeah! Finally we headed home, to rejoin reality and the cold, harsh winter...*le sigh*...what a great, relaxing weekend with friends. One can only hope that others can join in the costume fun next year, for the Second Annual ;)...oh yes, the SECOND annual. 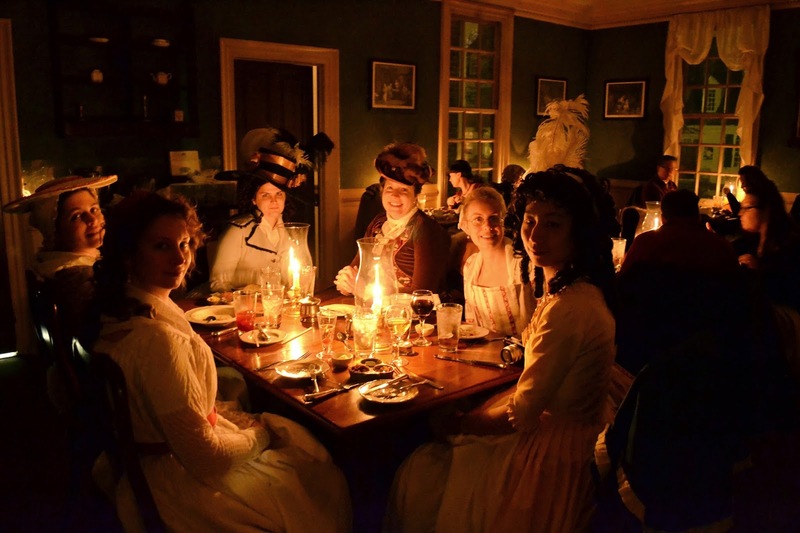 Costumed musical, costumed tavern dinner, fun in Williamsburg...ah, yes, please! 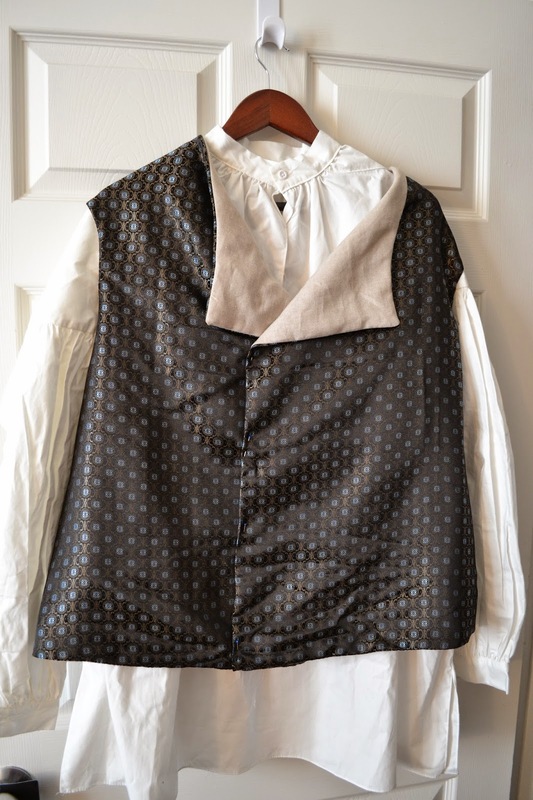 For February's Colour Challenge of blue, I decided to make a late 18th century waistcoat for my husband, using a pretty dark blue design poly fabric, light blue shot silver silk for the back, and lined with tan linen. I need to make him some outfits, so he has things to wear, so one of my focus areas of sewing this year, is to make some things for my husband for Colonial & Regency events. Not my best effort, but I'm new to men's clothes so I feel like I'm starting all over a bit! Notions: None yet - I plan to add buttons & buttonholes for ease of wearing. First wear was pinned. How historically accurate is it? 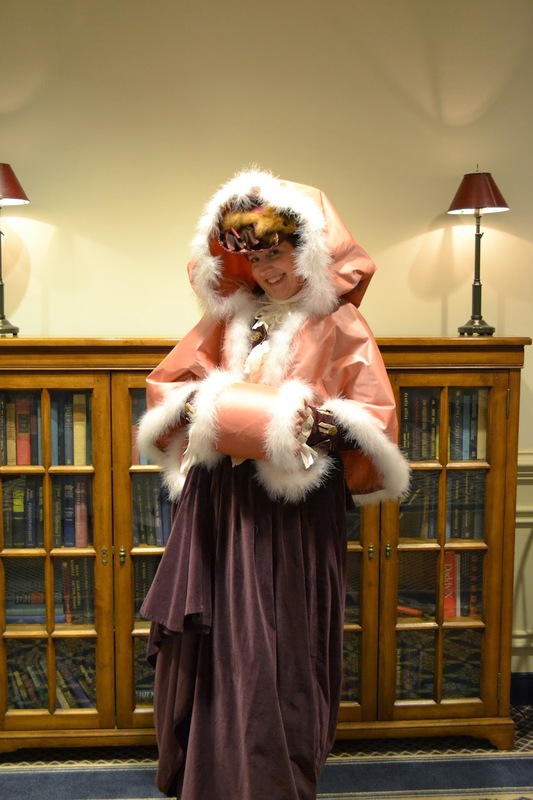 The pattern & shape are historically accurate; I sewed much of this by machine, so not so much accuracy there, and the fabric APPEARS historically accurate, but is not a material (polyester) that they would have had back then. 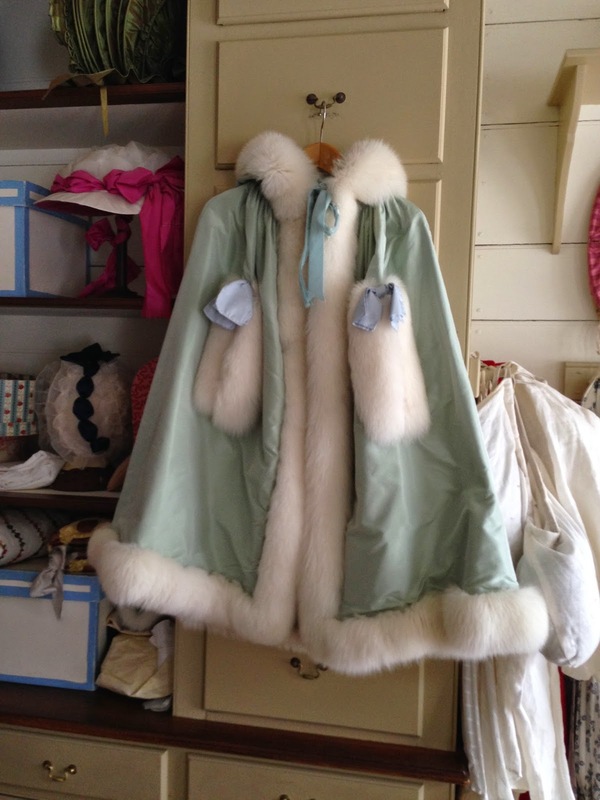 The silk back & linen insides are historically accurate, and a portion of this is hand sewn, also accurate. Hours to complete: Well, I'm slow sewing at times. Adding up all the pattern work, two muslins for fit, cutting out the final, pinning & sewing, well, probably 2-3 full sewing days overall? 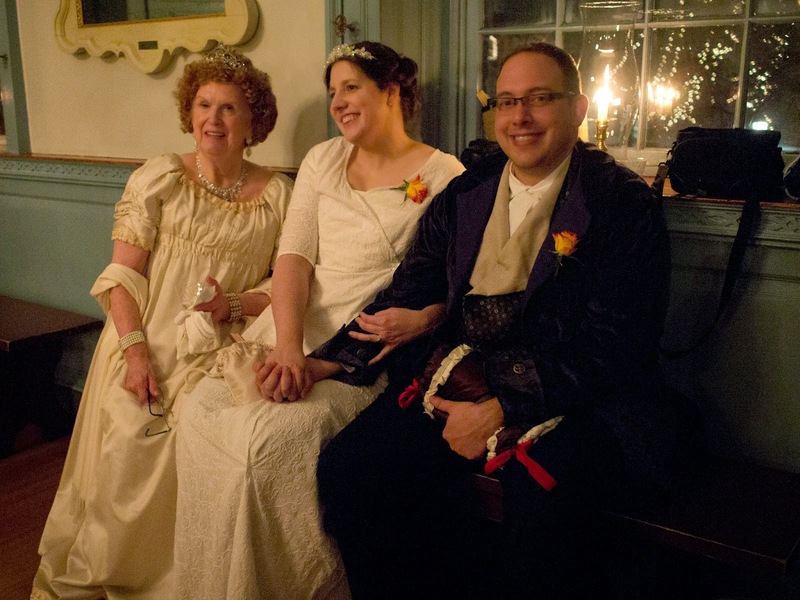 First worn: My husband wore this February 14th to Gadsby's for a 1799 George Washington Birthnight Ball on Valentine's Day: he was pinned in (period) for the first wearing, but I plan to add buttons/buttonholes in future. It also seems a bit big, even at double breasted, so not sure what is going on there. February's challenge, make something blue! Up next is HSM March: Stashbusting...I love stashbusting! 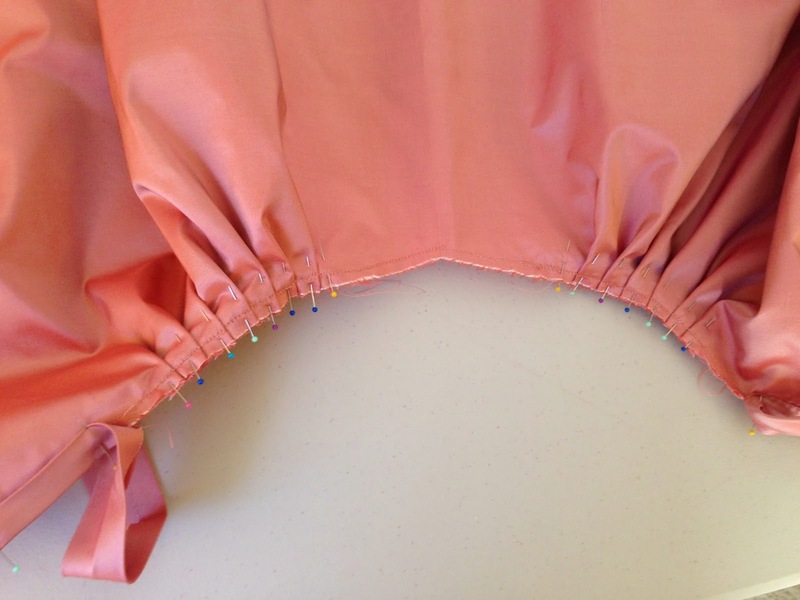 Make something using only fabric, patterns, trim & notions that you already have in the stash. Well, putting together the short cloak was not as simple as I thought: the hood turned out to be quite a bit more complicated than a simple collar would have been. 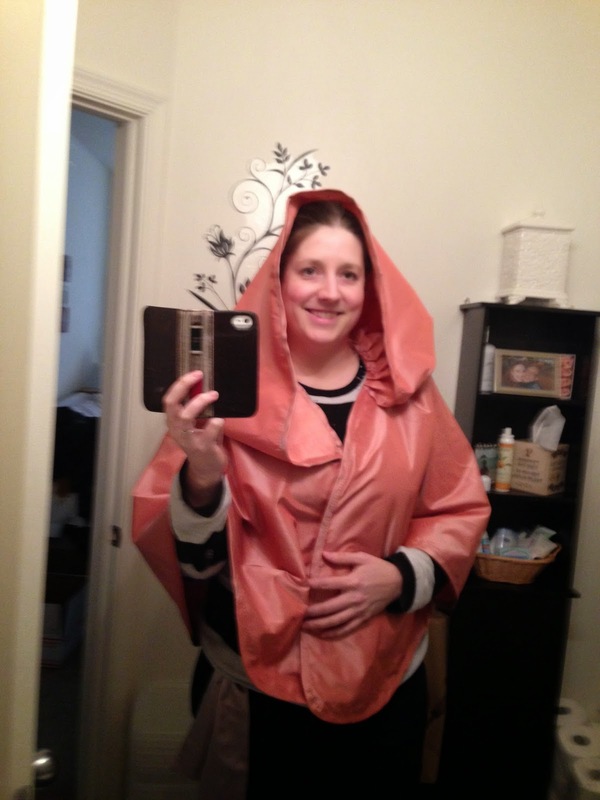 But as I wanted to stay as true to the original image as my creative freedom & fabric would allow, I opted for the hood! 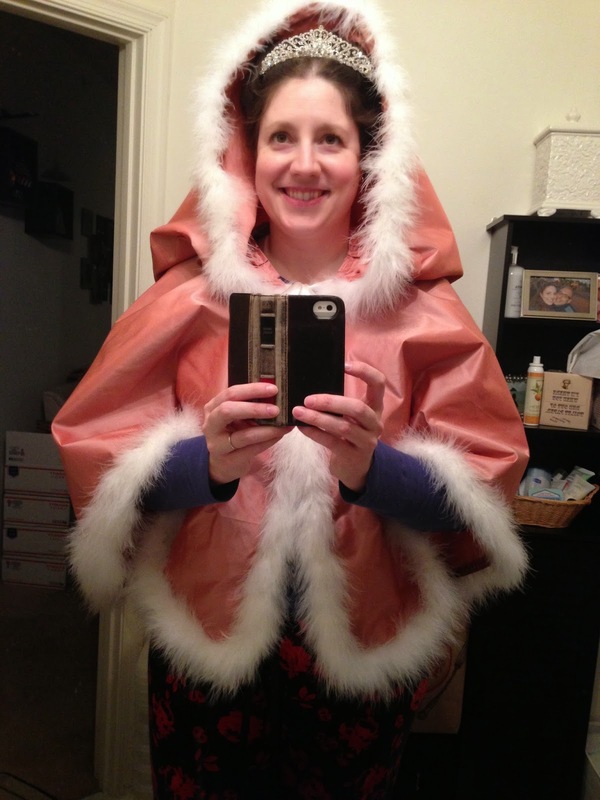 First up, here's a preview of the short cloak & almost finished muff! 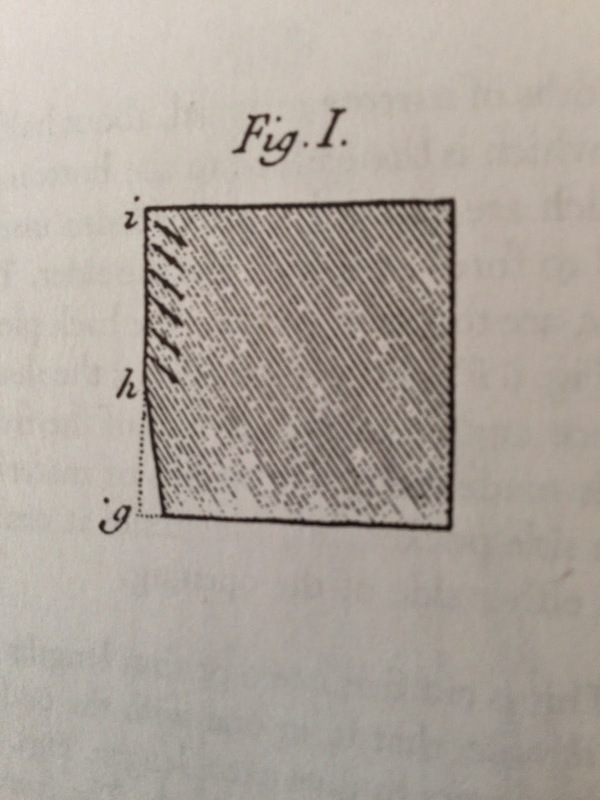 I began by re-visiting the page from 'The Cut of Women's Clothes' to discover next steps. 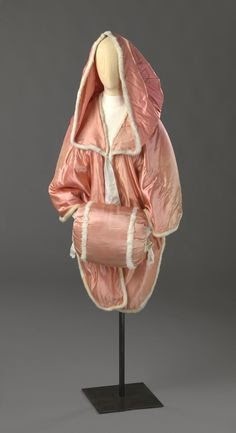 The first problem to work through, was the description of the hood, 'cut from two-thirds of material folded folded double lengthways...' - was that two-thirds of a an aune? or two-thirds of the original cloak piece, which was one and a half aunes (and two-thirds to half an aune wide)? Again, an aune is a French pre-Revolutionary term for length, and is roughly 47 inches. 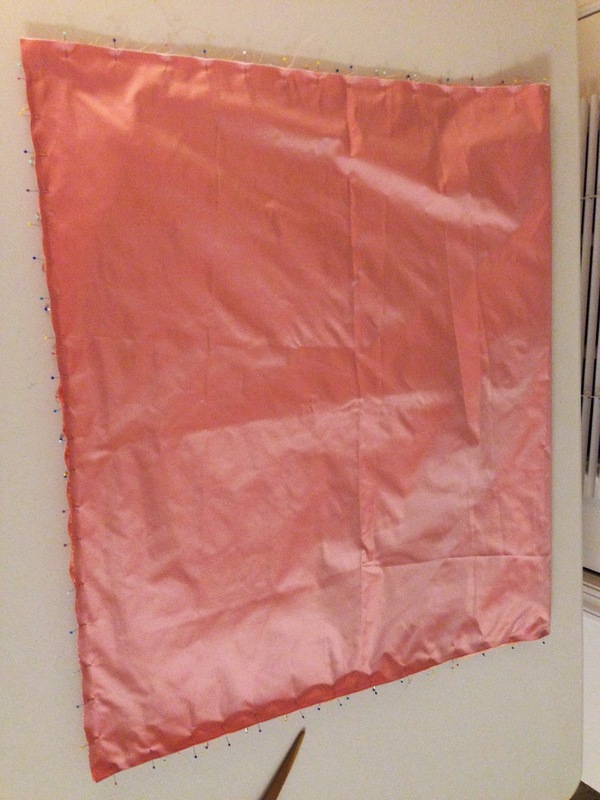 I decided it must mean two-thirds of the original piece, so I figured out I would need roughly 46" total (23" on the fold) by approximately 26" across. 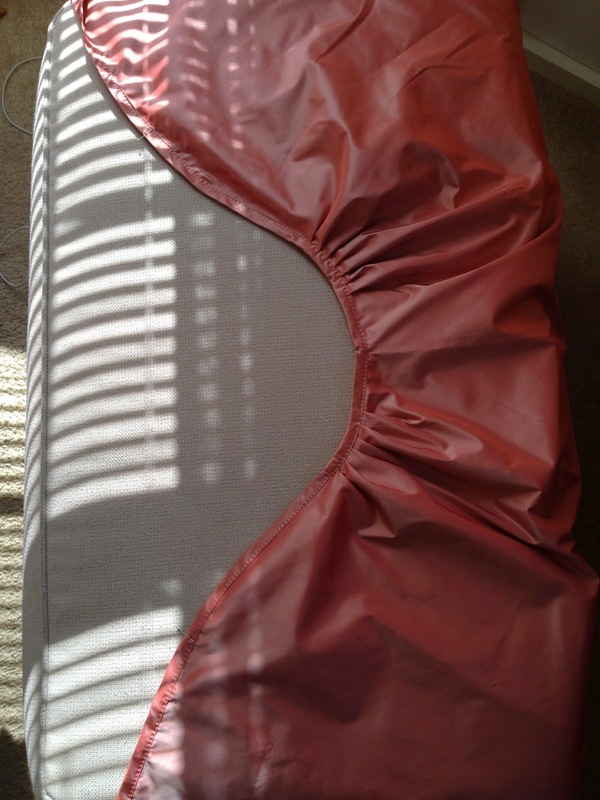 It also created a much prettier hood shape. So I attached the hood to the cloak base (I already had finished edges, so this was not too difficult), and then went about sewing down the white marabou feather trim (which took FOREVER, and was kind of a pain to work with). In the end, the effort was worth it, I love the finished result. I am finalizing the matching MUFF today, and then I will take pictures in costume this weekend in Williamsburg and post. A few more construction notes: you don't need to finish the edges of the cloak base & hood before attaching them: you can attach them and then finish the edges, it's just, sometimes I like to create things with little finishing touches, and I loved how the bias binding looked and the stability it added, so I decided to put this together in my own way, as I'm sure seamstresses throughout time have done :). I'm quite happy with how mine turned out! I'll post some better pictures soon! I hope this little short cloak hood mini tutorial was helpful! 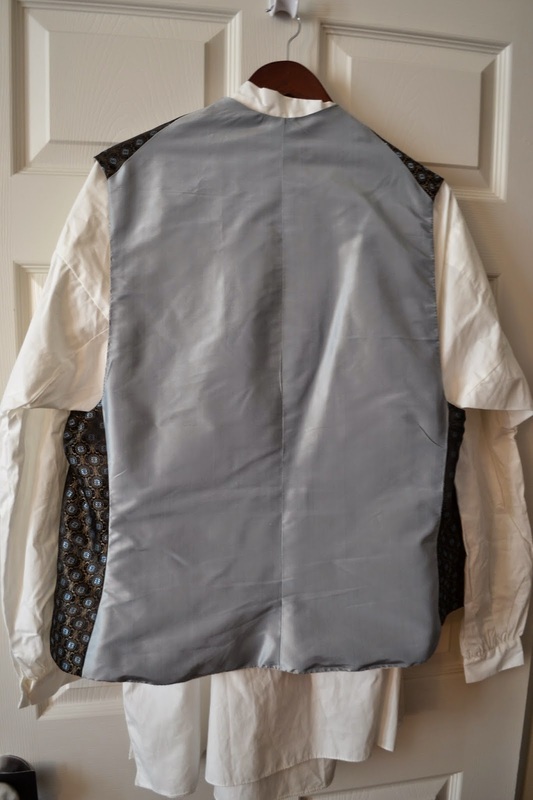 1) M's waistcoat: I fitted the second mock-up for M's modified 18th century waistcoat and now have the fashion fabric & silk taffeta back pattern pieces cut out. I lack anything exciting in the stash for the lining, so that will either be a nice white cotton, or I'll head to JoAnn's or G Street Fabrics soon to rectify that. 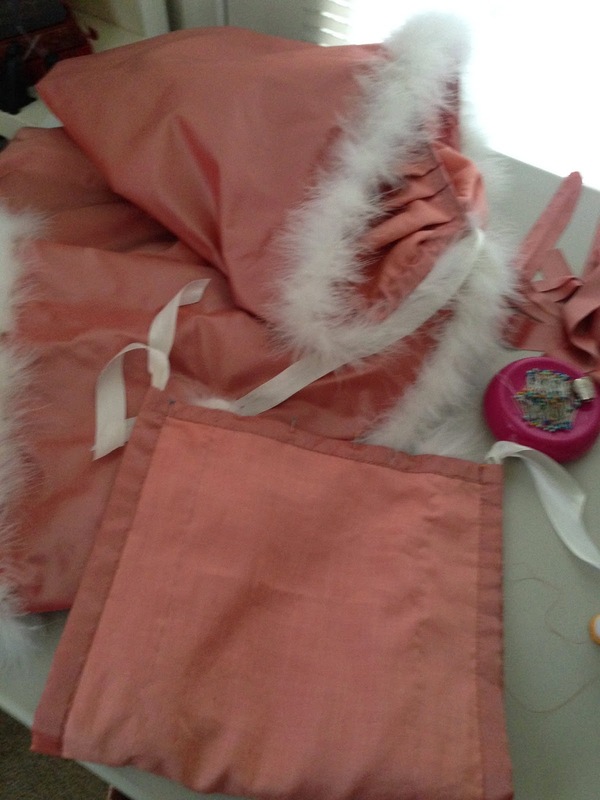 2) My rose pink cotton velvet Regency spencer: I finally picked apart the sleeve seams, sewing them back together with smaller sleeve allowance, pinned the bodice & cream dupioni silk lining together, and now ready to set the sleeves. 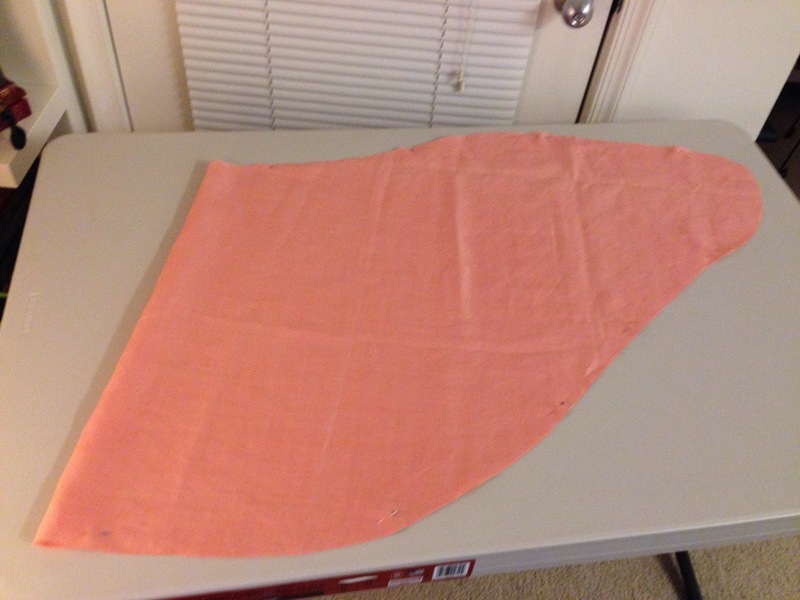 3) 18th century silk short cloak: I've had the fabric for this one since 2011, and finally getting it made! 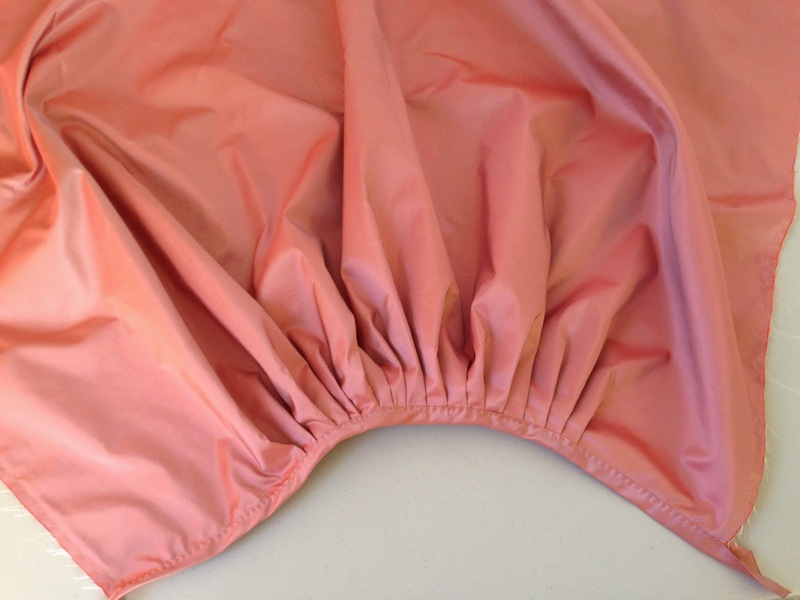 I found a pic of an extant garment years ago (2012 I think? - image at end of post below) that I could not resist adding to my 'I must make this some day' list, and although others have since also used this for inspiration, I don't have enough yards of another color of silk taffeta that isn't already 'committed' to a project, and I really wanted to stay true to the original on this one, so it's finally getting made! 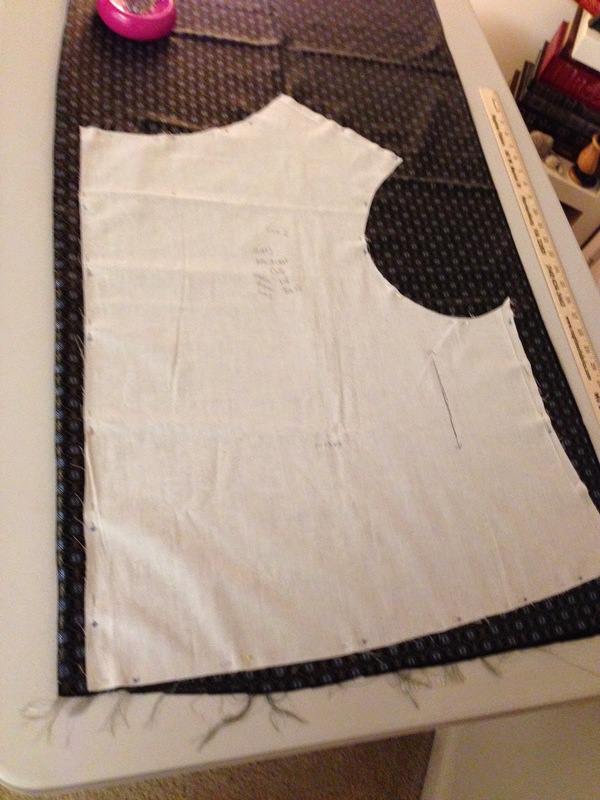 No pattern, so drafted this one: I looked at blog entries by a few well known costumers for general ideas on short cloaks, and to see how they shaped theirs, looked at a bunch of images online & doing further research, and then got started on making up a general shape in muslin. 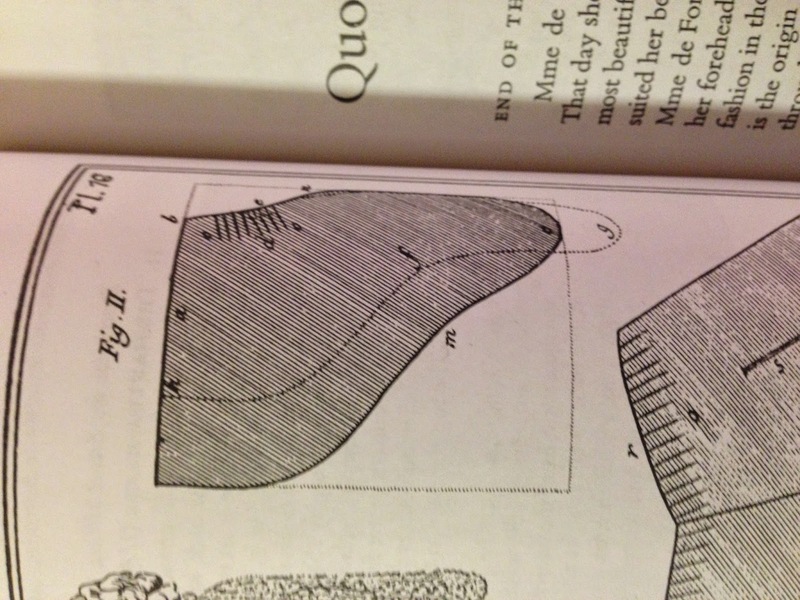 I recalled that someone posted about a reference to a short cloak in 'A Cut of Women's Clothes', so I grabbed that book off the shelf, google'd 'aune' (which is how the book describes the length & width) and converted 'aunes' to inches, and then referenced that image to get the 'final' shape closer to what I wanted. 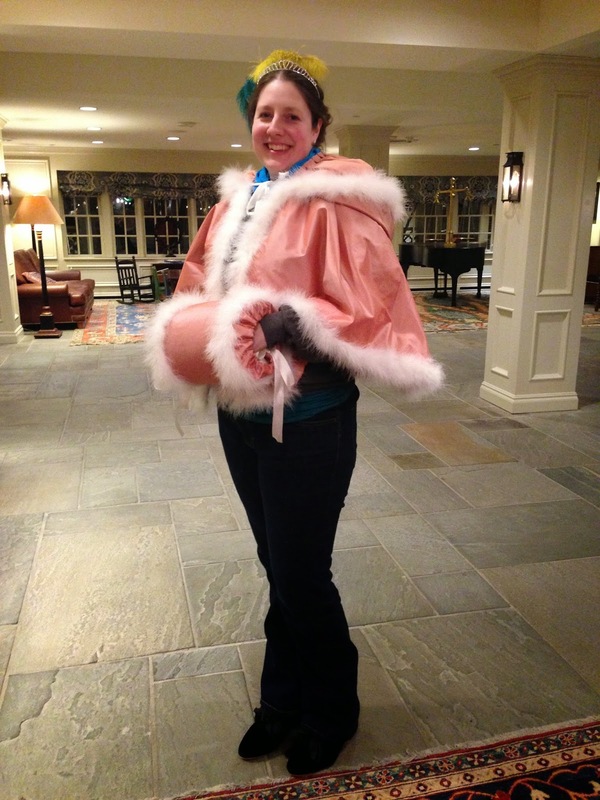 There were also multiple iterations of trying on, cutting & re-shaping, trying on, and again. My earlier guesstimations at shape were on the right track thanks to above mentioned research, but looking at the image in the book, I was able to get the final shape where I wanted it. 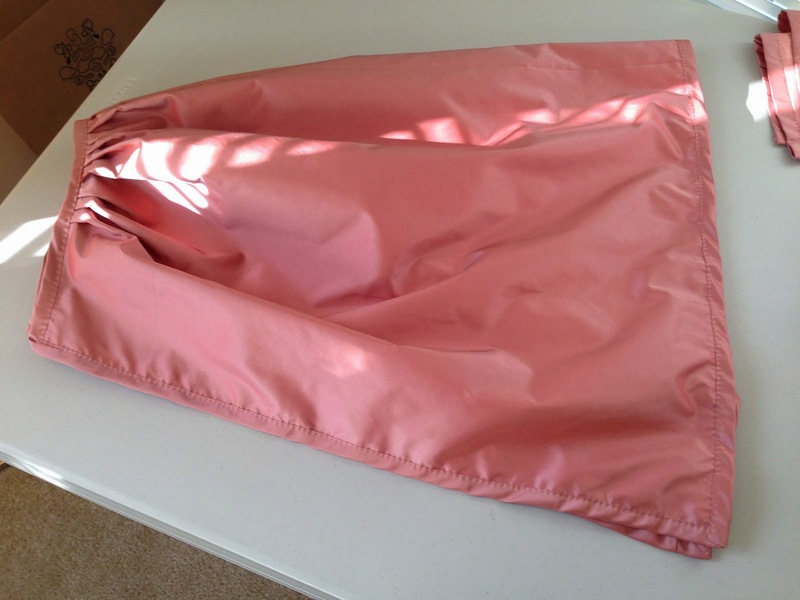 Once I was finally satisfied with my muslin mock-up, I cut out the actual cloak fabric using a pretty silk taffeta I picked out in the L.A. Garment District back in 2011, and lined with pink linen from PureSilks.us in India. 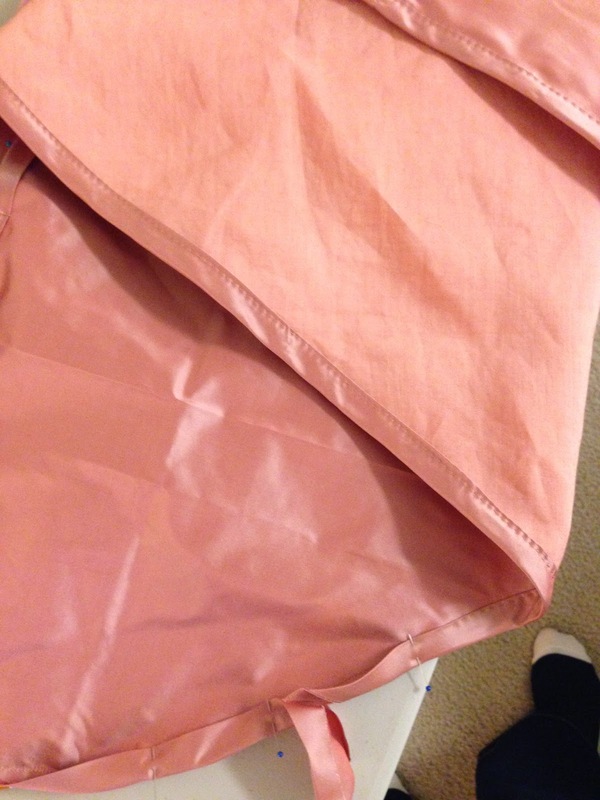 I basically cut out one lining in linen (on the fold) and cut out one fashion fabric (on the fold) in the silk taffeta; I decided not to line this as the linen already gives it a little weight, and I want this on the lighter, rather than heavier side. I pinned the silk & linen together, and machine stitched a very small seam allowance all the way around to hold the two together. 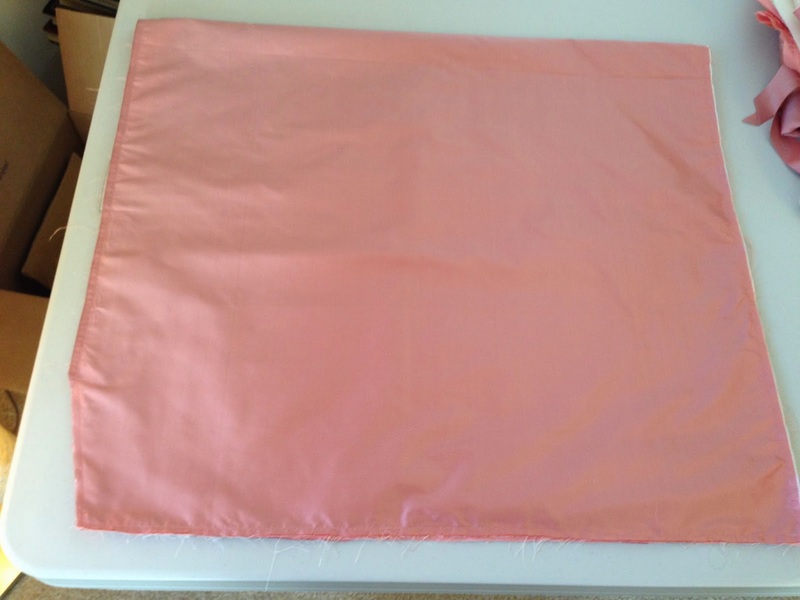 Now I am using bias cut binding from the same pink silk to finish the edges, pinned & sewn on to cover over the machine stitched seam allowance; basically hand sewing on the bias binding all around the edges. I still need to tackle the hood, which is described in the book as a fabric folded double lengthways with tiny triangles removed and with circular pleats gathered together...I also have to gather the neckline a bit, add the hood, then finish that trim, and then add the marabou feather boa/s. I also need to make the muff, which is cut out already. 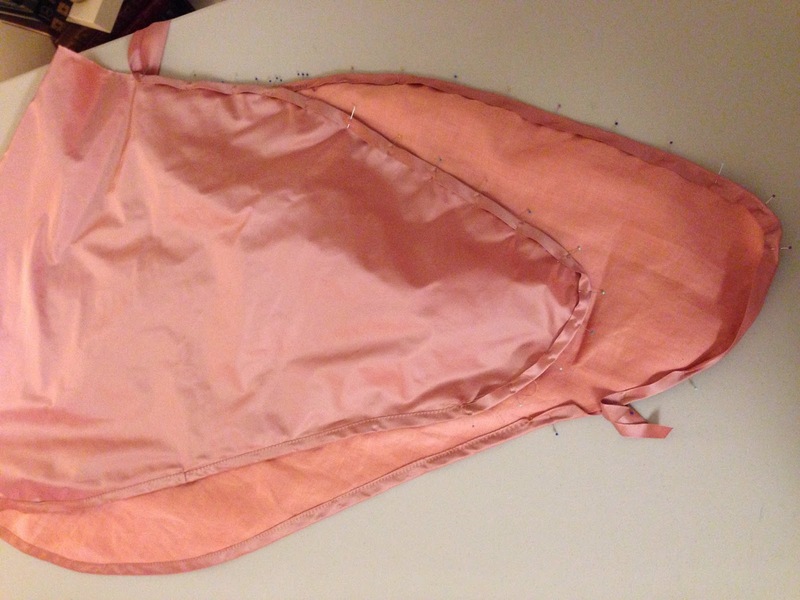 More sewing progress on this one soon!